JewishPost.com - Human Rights Council Challenged by UN Watch Over Killing of Israeli-American: Why Is The UN Silent? UN Watch's Hillel Neuer at the UN Human Rights Council. 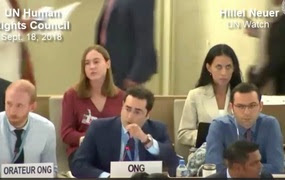 UN Watch's Hillel Neuer took the floor at the United Nations Human Rights Council last Tuesday to ask why they were silent on the murder of Ari Fuld, a 45-year-old Israeli-American father of four, who was fatally stabbed by a Palestinian teenager on Sunday. (CNSNews.com) – The UN Human Rights Council was castigated by a non-governmental organization [UN Watch] this week for its silence over the murder of a dual Israeli-American citizen, whose killer’s family stands to receive a monthly stipend from the Palestinian Authority. 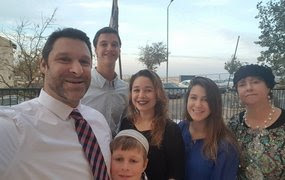 Ari Fuld, 45, was stabbed in the back by a 17-year-old Palestinian in a shopping mall parking lot on Sunday, and managed to chase and shoot and wound his assailant before succumbing to his wounds. Though fatally injured, the former Israeli Defense Forces paratrooper prevented the terrorist from stabbing a mall employee whom he was pursuing. Hila Peretz said afterwards Fuld had literally saved her life. Palestinian terrorist groups lauded the killing of what they called a “settler” – a reference to the fact Fuld lived in Efrat, a community located in territory disputed between Israel and the Palestinians. During a session of the Human Rights Council in Geneva, UN Watch executive director Hillel Neuer drew attention to the killing. “I want to ask the United Nations and this council: Why has no official of this body condemned the murder?” he asked. The P.A. “prisoner affairs commission” has confirmed that the family of Fuld’s killer, Yusef Jabarin, will receive a monthly stipend of around $390, with the sum increasing if he remains in prison for a number of years. In Geneva, Neuer pointed to reports about the payments to Jabarin’s family. P.A. and Fatah leader Mahmoud Abbas has defended the payment of stipendsto the families of terrorists who are imprisoned or who have been killed while carrying out attacks, saying he will not bend to foreign pressure. “Even if we only have a penny left, we will give it to the martyrs, the prisoners and their families,” Palestinian media quoted Abbas as telling relatives of slain terrorists in July. A Hamas spokesman called the killing “heroic” and Islamic Jihad praised the “heroic operation,” calling on West Bank Palestinians to “escalate military operations against the settlers." Fuld was known for his pro-Israel advocacy on social media and in other forums. A bipartisan bill passed by the House of Representatives last December withholds U.S. funding to the P.A. until it stop paying the stipends. The measure was named for Taylor Force, a U.S. Army veteran and Vanderbilt student stabbed to death by a Palestinian in Jaffa during a 2016 study trip. Fatah praised the terrorist, who was shot dead after killing Force and wounding ten others, as a “heroic martyr” and his family received the stipend. The Taylor Force Act was incorporated into the $1.3 trillion spending bill signed into law by Trump on March 23. The Trump administration withdrew from the Human Rights Council last June, citing severe anti-Israel bias and the presence on the council of rights-abusing regimes.